Helen Mirren and Paul Giamatti are among the stars of "The Last Station." (CNN) -- It's easy enough to venerate a saint, even of the secular variety, but you wouldn't want to find yourself married to one. 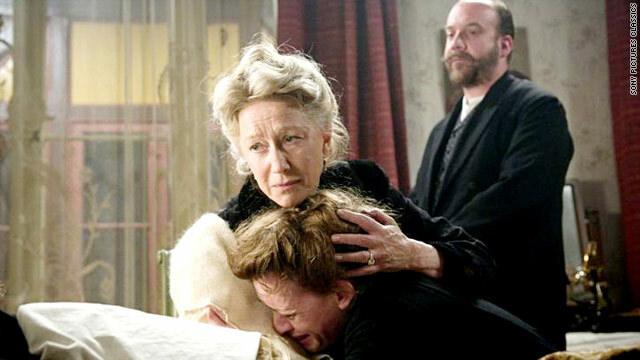 At least, that's the experience of Sofya, the Countess Tolstoy (Helen Mirren). She is distinctly unimpressed that her husband, Leo -- the most famous novelist in all of Russia -- has embraced celibacy, vegetarianism and anti-materialism. Indeed, she may be the only thing he hasn't embraced in his old age. The one passage of Tolstoy that most people know is the famous opening to "Anna Karenina," about how happy families are all alike, but every unhappy family is unhappy in its own way. He obviously knew what he was talking about. The biggest bone of contention between the countess and Tolstoy is copyright: She takes a proprietorial interest in the great novels that she transcribed by hand and, she claims, edited, not just for her own sake but because these will provide for their children and their children's children. Tolstoy sees things differently. Urged on by his most determined acolyte, Chertkov (Paul Giamatti), he means to bequeath them to the people of Russia. It's not the kind of dispute that clogs up the divorce courts. Caught in the middle is the writer's new secretary, Valentin (James McAvoy), a dedicated "Tolstonian," hired by Cherkov precisely because he shares their lofty convictions. Valentin is entranced by his idol, but he's surprised to find him much less of an idealogue than he expected. Tolstoy -- Christopher Plummer in a serf's smock and an unshorn beard -- is warm and generous, and indulges in frequent reveries about the sensual exploits of his youth. Falling in love for the first time himself, Valentin comes to suspect that Cherkov may be the insufferable prig the countess says he is. "The Last Station" leaves us in no doubt on that score. In fact it signals its sympathies with the sensualists so early on, it's a mystery why writer-director Michael Hoffman keeps harping on it. Moustache-twirling proto-Bolshevik intellectuals bad; aristocrats good: We get it! I exaggerate, but only a little. In fairness, Christopher Plummer makes an excellent case for Tolstoy's essential virtue, even if it's rather hard to square with his actions. But it would take something more than a saint to withstand the force of Helen Mirren's serio-comic derision and despair. Seizing on her juiciest role since "The Queen," Mirren is haughty and earthy, fulsome and withering, vicious and pathetic. One minute she's scampering across balconies to eavesdrop on her husband's plans, the next she's rolling on the floor in distraction. It says much for the actress' formidable caliber that she retains our respect and her own dignity. (As an aside, what a relief to see an actress with experience imprinted on her face: no surgery here, not even a hint of Botox, just a woman unashamed of her age). Hoffman, who made "A Midsummer Night's Dream" and "The Emperor's Club," seems to have a bit of a fetish for literary pedigree, but he's no highbrow. Imperial Russia has a rather decorous British feel to it, and not just because of the Anglo accents. We might be in Stratford if it weren't for all that facial hair. Admirers of the classic British costume drama will savor what they perceive as the film's good taste and sophistication, but to do so, they will have to overlook Hoffman's banal visuals, the drama's stultifying obviousness and the tediously protracted last act. "The Last Station" coughs up enough biographical tidbits to keep you watching, but it's specious brand of art film: as predigested as any Hollywood blockbuster and twice as sanctimonious. "The Last Station" runs 112 minutes and is rated R.